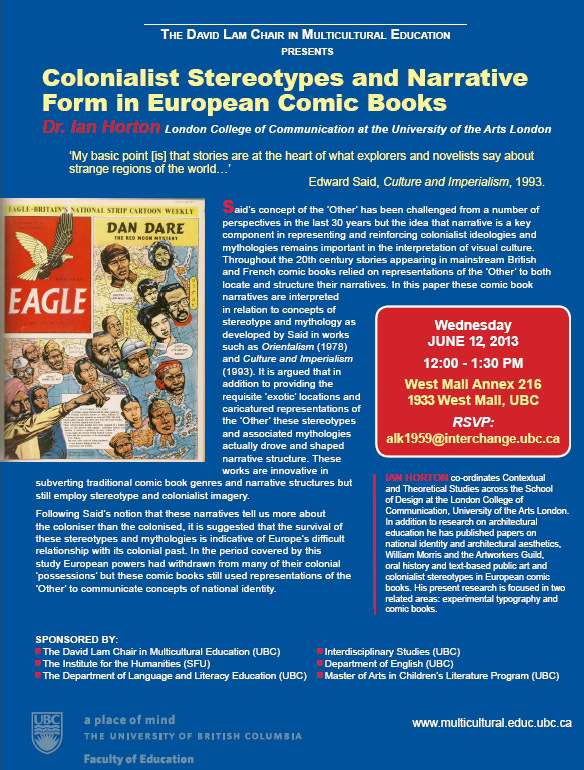 The Master of Arts in Children’s Literature Program is co-sponsoring a lecture on June 12th by Dr. Ian Horton of the London School of Communication called “Colonialist Stereotypes and Narrative Form in European Comic Books.” It will be a very exciting lecture. You are invited to join us at noon on Monday, October 3 for a special lecture on a a cultural and spiritual landmark. “An Eighty-Year journey: The Making of the King James Bible” will be presented by Professor R. Gerald Hobbs, Emeritus Professor of Church History & Music, Vancouver School of Theology. 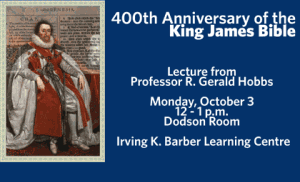 This event is held in conjunction with an exhibition – entitled The 400th Anniversary of the King James Bible 1611-2011 – that is on display at UBC Library’s Rare Books and Special Collections division. For more about the event and to register, please visit here.